GLUT3 antibody LS-C15400 is an unconjugated rabbit polyclonal antibody to human GLUT3 (SLC2A3). Validated for ELISA, IHC and WB. SLC2A3 / GLUT3 antibody was raised against synthetic peptide corresponding to 12aa sequence in the C-terminus of human glucose transporter-3 (hGLUT 3) (KLH coupled). Recognizes human GLUT 3 (Glucose Transporter). Species cross-reactivity: Does not recognize mouse/rat GLUT 3. For mouse and rat samples use LS-C15403 or LS-C15404. Suitable for use in ELISA, Western Blot and Immunohistochemistry. Western Blot: 1:1000-1:5000 (ECL); Detects a major band at ~45kD. 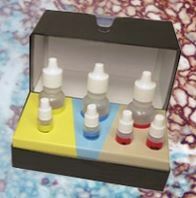 ELISA: 1:10000-1:50000; Coat plates at 1 ug/ml with Control Peptide.